Sale will be held jointly by Matthews Auctions, LLC, and Gavin Pope Auction Company. (RAYMOND, Ill.) – A monstrous two-day auction dedicated to farm and construction toys, Lionel toy trains and vintage toys will be held the weekend of Feb. 20-21 at a former furniture store building in Raymond, Ill., located halfway between St. Louis and Springfield, Ill. In all, nearly 1,000 lots will cross the block. Online bidding will be facilitated by Proxibid.com. The sale will be a collaboration of two auction houses: Matthews Auction Company, based in Nokomis, Ill., and Gavin Pope Auction Company, headquartered in Raymond. A crowd of around 80 people is expected for the two days, while pre-registration for Internet bidding has been brisk, according to Dan Matthews. “I expect many of these items will sell online,” he said. The Saturday, Feb. 20 session, beginning promptly at 10 a.m. (CST), will comprise over 500 lots of farm toys and construction toys. Featured will be a fabulous John Deere memorabilia collection, to include oilers, pencils, pens, pocket knives, calendars and more. The Sunday, Feb. 21 session will boast over 300 lots of Lionel toy trains (mostly new in the box), circa 1950s-’90s. Feb. 21 will also feature more than 75 intriguing vintage toys, to include pedal cars, toy wagons and more. A partial listing of what will be offered both days may be viewed on the Matthews Auctions, LLC website, at www.MatthewsAuctions.com. A full catalog will be posted online soon. A 10 percent buyer’s premium will be charged on Sunday only (none on Saturday). The Feb. 20 session will have four primary components: custom toys, John Deere items, International and other farm toys, and construction toys. 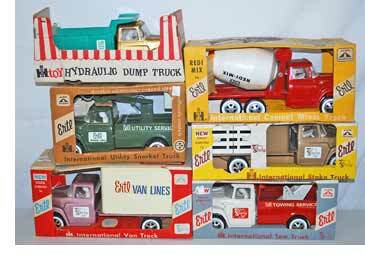 The custom toys will feature Ertl trucks, highly coveted by collectors. Sold will be a rare IH Loadstar cement mixer (possibly with box); an IH Loadstar wrecker; an IH Loadstar equipment trucks; white cab-over box trucks; and more. The Ertl brand will cross over into the John Deere category, too. Sold will be Ertl John Deere precision models #1-25, all new in the box (including all the hard-to-find ones); an Ertl John Deere A, with drive and arcade wheels; and an Ertl John Deere A, with two-hole flywheel. Also sold will be John Deere 2-cylinder tractors (1990-2008), all new in the box, in great shape. Other John Deere pieces to be offered include 620, 720 and 820 industrial examples; a Plow City 1010 crawler; a 430 crawler; 4320 and 6030 examples, new in the box; 4960 and 8400 MFWD; a restored 12A and 30 augur combine; a 6600 combine with metal gear drive platform; a near-mint dirt scraper; combines (Turbo and Titan II); and disk plows and other implements. International toys will include a 5288 farm set; three Precision F-20s; 1206 and 806 models, both repainted; a 1026 gold; a model 560; an F-20 Iowa Welcome Center; several Cubs; an MTA SE; and several other pieces. Additional farm toys will feature a Tru-Scale combine; an Oliver OC-3 Crawler, new in the box; and Ertl Texaco truck and airplanes banks (No. 1 thru 22). The farm toys category will also feature a large selection of other Texaco toys; a Buddy L Texaco tanker; a Brown Bigelow jet fuel tanker; and pedal tractors, to include a Case CA; John Deere small 60, 20, 730 and 4430 models; a small Massey model 44; and several other examples. Custom toys will include a Weber Case with dual elevators; an Allis WD-45, with picker; a Woods Brothers one-row picker; a Cottonwood Acres State Highway truck; a Standard tank truck; a Riecke F-20; a Freiheit International Harvester Farmall 300; a Hartz-Partz John Deere 330; a Nolt John Deere L; a custom John Deere AR; and a custom Yoder John Deere model 730. Construction toys will be abundant and feature Revell Caterpillar scrapers, graders and bottom dumps; an Ertl Cat motor grader; an NZG or Conrad Caterpillar 1/50 scale truck, almost new in the box; a 2-944 Wheel Loader NZG; D8N and D9N, silver edition; a 797 off-highway truck; a D11R track-type tractor, gold and silver edition; and a 793D off-highway toy truck. Other construction toys certain to get paddles wagging and online bidders juiced include a 245 excavator; a 245 shovel excavator; a P-450 Profiler; a 988B wheeler loader; a 627push-pull scraper; a D400 articulated dump truck; a 615 scraper; a 769C truck; a 416 backhoe; a 966D wheeler loader; a 215 excavator; a 224 wheeler loader; and a 416 backhoe loader, silver edition. Matthews Auctions, LLC’s next big sale after this one will be a Spring 2010 Peotone Petroliana and Advertising Auction scheduled for Friday, Mar. 5, in Peotone, Ill., starting at 12 noon (CST). Featured will be the Gulf collection of Pat Lutz. Then, on Saturday, April 24, the firm will conduct a Petroliana and Vintage Advertising Sale in Redlands, Calif., at 2 p.m. (PST). On Saturday, May 1, Matthews Auctions, LLC will hold a Classic Car, Petroliana, Gas Pumps and Vintage Advertising Auction in Wisconsin Rapids, Wisc. Offered will be over 20 classic cars, a great selection of gas pumps and signs, and more. Then, on May 15, an Absolute Petroliana and Automotive Advertising Auction will be held, in Loveland, Colo. Featured will be the single-owner collection of Clyde Hodge. Signs, globes and other collectibles will be offered. To learn more about Gavin Pope Auction Company, you may call them at (217) 825-8682.